Well here I am sat hooked up to an I.V while I blog. How's that for multi tasking? This admission isn't going too badly (touch wood!) It's too soon to tell if my lung function has improved, but yesterday I managed to do 20 minutes on the treadmill, I was a bit broken at the end of it mind! Weekends in hospital are fairly rubbish, the place is pretty much empty due, I guess, to clinics only being run during the week and most of the inpatients staying on the wards. The weather is all cold and dull, and apart from a few hardy smokers, no one wants to be sitting outside. I much prefer it during the week when there are plenty of people watching opportunities ( that isn't as creepy as it sounds) and maybe even a few people to say hello to. I get visitors during the week too which is always ace, my hospital is 60 plus miles from home so I do get homesick and I feel a bit cut off. It's nice to get that reminder that you aren't completely on your own. My lithotripsy is scheduled for Thursday, hopefully I will be home the week after at the latest. As I have finally mastered i tunes, I have been filling up (and spending way too much money on) my ipod with songs I am going to listen to while I get blasted. I have rediscovered my love for Radiohead, I was obssesed with them at one time. I have been to see them twice and I'm pretty sure Thom Yorke smiled at me...wishful thinking maybe. This past week I have been accepted as a seller on consciouscrafties . This is an ace place where the sellers all have an illness or disability or are caring for someone with one, As usual C.F and its impeccable timing means I am unable to start listing items until I escape from hospital, I'm really excited to get started though, it's giving me lots to think about. I've had a lovely welcome, its a really friendly group and I've seen some lovely makes already, Here are a few, the photos are links to the shops. I have been having a play with wire this week, it's pretty hard going on the fingers! I haven't made much progress but am quite happy how what I have managed to make has turned out, it almost looks like what it should do! 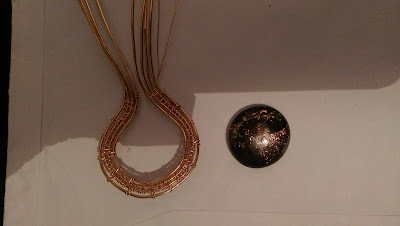 Here is an awful picture of the frame so far and the cabochon that I hope it will fit around.